Technical representatives from member countries of the Latin American and the Caribbean Economic System (SELA) have arrived for talks on economic and cooperation relations among Central America, the Caribbean and Mexico. The Regional Meeting on an assessment of the economic and cooperation relations is geared towards placing at the forefront the importance of trade, investment and cooperation relations among Central America, the Caribbean and Mexico. The meeting opened this morning at the CARICOM Secretariat in Georgetown and will conclude tomorrow. “The ultimate beneficiary of all of our efforts must be the hundreds of millions of people who formed the population of our countries…in strengthening the mechanisms for cooperation we must ensure that the opportunities created are accessible and beneficial to all side and at all levels so that diversification in its broadest sense can occur,” Gaskin said. Gaskin believes that the inequalities that currently exist can be reduced, coupled with the potential of CARICOM benefitting from expanded trade with Central America and Mexico. 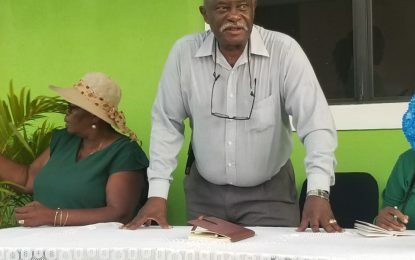 “What we will achieve as a country over the next 50 years will depend largely on the strength of the relations that we forge… The purpose of the meeting is relevant to Guyana’s post-independence experience as country is more dependent on relationship with other countries,” he explained. CARICOM’s Assistant Secretary- General, Trade and Economic Integration, Joseph Cox, in his remarks noted the importance and timeliness of the meeting. Cox noted that the global economy is still slowly recovering from the deepest recession since the great depression of the 1930s and the Caribbean like so many others were buffeted by the shocks that emanated. “The current dynamic dictates that it is imperative for a policy framework guiding economic activity over the medium term must be aimed at facilitating macro-economic stability within the confines of an entrepreneurial economy that is competitive and business oriented but which boasts broad based and inclusive economic growth coupled with an appropriate social protection mechanism” Cox said. According to Cox, it is imperative that the region recognizes that over the medium term, its strategy must be centralized to focus on fiscal reforms to facilitate sustainable debt trajectory and prioritise expenditure in order to facilitate economic recovery. “If we are to make bigger strides the following need to be addressed; private sector from each side to get to know each other better by gaining understanding of business climate and culture of each country; a proper understanding of policies and laws governing trade on both sides to reduce the time it takes to do business with each other; any non-tariff barriers impeding trading among parties… we urgently need to address the biggest constraint which is more direct transportation links specifically lack of direct sea links that poses a huge problem since it negatively affects competitiveness on both sides,” Cox explained. Javier Gordon Ruiz, Director, Relations for Integration and Cooperation, Permanent Secretariat of SELA also welcomed representatives to the two day meeting. CARICOM and Central American countries share mutual business interests and have signed several trade agreements, which may be connected with the single Free Trade Area established between Mexico and Central America. This was done to take advantage of the geographical proximity and the potential market in goods and services, as well as to encourage investment and cooperation in the greater Caribbean region.